It was a long weekend and we as a family decided to take off to a nearby destination to chill, relax and do some world heritage sightseeing, all in tow with a toddler. My girl loves to travel. She has been travelling since she was twenty-one days old. So I was assuming that I have now mastered the art of travelling with a tot. But no, that does not happen. Every trip of mine is a new lesson in parenting, gives me a new perspective to how she will absorb all the activities going on around her, the innumerable fraction-of-a-second decisions that I would have to make and still ensure we all enjoy the trip. So here are my travel tips with babies and some anecdotes on how I learnt my travel lessons the hard way and I hope you feel encouraged to backpack your little one for your next travel soon enough. Please do share your tips with me too. Am sure I can learn more. 1. 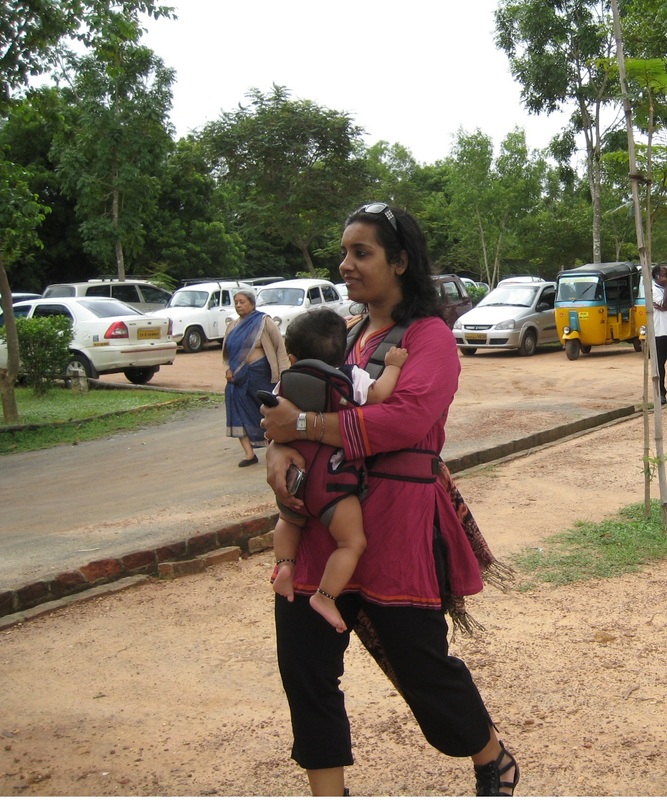 Perambulators, Strollers and Sling carriers: Depending on the age, always, just about always carry either a sling carrier bag or a stroller for the child. And by always I meant at least till he or she is five years old. Please do not imagine that you would be lugging them around and it is fun. It is not. Our trip abroad was smooth only because we had a stroller along and it made so much sense to strap her up there as we all were wearing some five layers of clothing and I couldn’t imagine sight-seeing or even seeing with her on me. Strolling her gave us the gift of pace and gave her the freedom to enjoy. 2. Diapers and nappy bags: I swear by them. Nappy bags are handy for all kinds of situations; baby poop to vomit, litter to soiled clothes… and the fragrant bags make it all worth the buy. You can get them off the shelves of any supermarkets or online stores. I decided to keep my child in diapers in all her travels. It kept me sane, kept her clean and we saved up on unnecessary laundry. You can always resume your toilet training skills and lessons once you are back. But when vacationing, give yourself a break too. 3. First Aid Kit: Must-have. Be it Allopathy or Homeopathy, always carry the bare minimals. I always carried a kit. A standard list of medication. Paracetamols, band aids, saline nasal drops, and some things suited for the tummy and throat, motion sickness medicines etc. The one time I forgot to carry one (this vacation in a remote part of the country by the sea in a resort) and the child came down with fever, stomach upset and there was no doctor-on-call in the resort. I was not just panicking but was beating myself up for not carrying my kit. Of course she got better the next day but it sure is a lesson learnt for life. 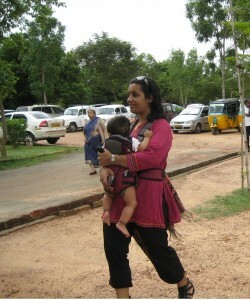 I will carry a few lesser pairs of clothes but never travel without my baby’s first aid kit hence forth. Always check before travel if the destination where you are off to has a doctor-on-call or a pediatrician. 4. Crayons, colouring books, music and videos downloaded: We all know about this. Don’t we! 5. Home cooked food: Not necessarily for the entire trip, but for some part of the journey. I learnt it the really hard way. I always did carry some food for my baby. But for our trip abroad, my sister-in-law harped on carrying home cooked food for the entire journey. I ridiculed her saying how and why would anyone carry home cooked in an international carrier but I did still listen to her and carried food for the baby. Of all the things that never happens to anyone and that we faced was that our flight had short-circuit in the food heating panel and all the food had gone bad. Scary as it was, we were hungry the whole stretch of the nine-hour journey with no food being served at all except for Snicker bars and water. Thankfully the baby’s food that I carried was fine and I could feed her every time she woke up from her nap. Till date, every time I think or narrate this incident, my heart goes all out to bless my sister-in-law for her most valuable parenting tip to me. 6. Weather updates: Check for weather updates before hand for the next one week of travel so you know what you need to carry in advance. Climatic changes not withstanding, summers can get rainy, monsoons can go all dry and winters may become super winters. So a weather check is not so unnecessary. 7. Speak to her about the place: You will be surprised at how attentive they are; how much they listen and understand. I do not even care much about understanding. I am at this point in time just trying to do word and picture associations with her. It started off without me teaching her. We visited a museum once and she has figured it is a place for statues. She remembers that sea has sea-shells and rivers don’t have waves. She knows when to call it a room and not a home when she is travelling. She knows we carry maps when we travel. Talk to them. Narrate what you are seeing. Tell them names, landmarks, little bit of history in plain simple English and it helps. You will be surprised when she recounts them later. I for sure am. Go on. Have your share of fun as a parent. It is enriching to say the least.